Janet Jennings was one of twelve children raised on a farm outside of Monroe. 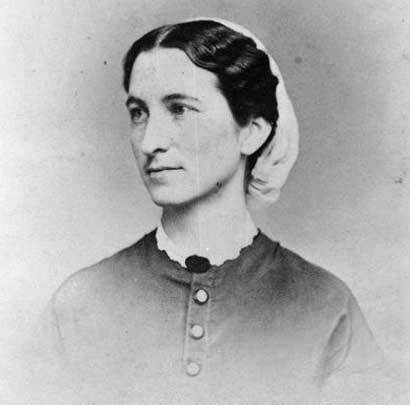 As a young woman, although she had never trained as a nurse, she went to Washington, D.C., during the Civil War as a volunteer to help care for wounded soldiers. Years later, she became a respected journalist and even published two books, including Abraham Lincoln, The Greatest American. After the Spanish-American War began in 1898, Jennings travelled to Cuba along with the Red Cross, hoping to cover the conflict as a reporter, but ended up stepping in to fill a desperate need for medical help. She cared for ill and wounded soldiers in a poorly equipped, understaffed Army hospital, and then volunteered as the only nurse on the ship Seneca, which evacuated “the worst of the wounded” back to the U.S. to make room in the hospital in Cuba for new casualties. The ship had only two inexperienced doctors and hardly any medical supplies, and the harrowing trip to New York, with limited water, bad weather, and numerous soldiers and other passengers wounded and sick with fever, took longer than expected. Officers and passengers on the ship signed a testimonial letter thanking Jennings for her heroic efforts, and she became known as “the Angel of the Seneca.” In the months following the ship’s arrival in New York, Jennings gave interviews to newspapers, spoke to audiences in Wisconsin, and even testified before a presidential commission about the conditions she had witnessed and experienced. “Janet Jennings.” American Association for the History of Nursing. https://www.aahn.org/jennings. Jenny, Gerald. “Janet Jennings and Her Cow.” Wisconsin Agriculturalist and Farmer, Monroe, WI, November 25, 1926. Walsh, John Evangelist. “Forgotten Angel: The Story of Janet Jennings and the Seneca.” Wisconsin Magazine of History, volume 81, number 4, Summer 1998, pages 267-293.